Keachi is considered one of Louisiana’s richest treasuries of Greek Revival structures, boasting the only surviving temple style commissary in the state and three antebellum churches. With a population of less than 300, the town has eleven listings on the National Register of Historic Places. 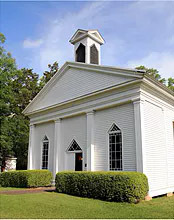 Keachi is known for its pristine white churches and its classic old-fashioned festivals – at Halloween, the 4th of July, and the spectacular Christmas musical – a chamber quartet with seasonal music and carols performed in the circa 1858 Keachi Presbyterian Church. One of the first buildings erected in Keachi was Good Hope Baptist Church in 1852, with 18 members. The church was off to a good start so only a school was needed to make the community complete. With financial backing from Mr. T. M. Gatlin, Keachi Female College was formally opened in 1857. Under President J. S. Bacon, students took Latin, Greek, biology, philosophy, geology, chemistry, German, French, elocution, art, voice, piano, violin, and ornamental needlework. At the time of the Civil War there were 125 ladies from the best homes in Louisiana and Texas attending the college. When the Civil War broke out the school was forced to close as students and teachers joined the cause. The DeSoto Parish Police Jury gave the Keachi Highlanders $1500 to organize their unit. They were known for their unusual dress, kilts, and plaids. During the war the college was used as a depot for medical supplies shipped overland from Mexico and after the Battle of Mansfield, it became a hospital for both Confederate and Union wounded. In the fall of 1880, a tornado struck the college resulting in the death of President Jeremiah Tucker and a teacher. The storm blew away part of the main building and damaged others. However, the administration managed to repair it, and by 1891 enrollment had climbed to a record 217. The opening of other colleges in Natchitoches, Ruston, and Pineville gradually took their toll. After efforts to revive enrollment failed, the college closed forever in the fall of 1912. Today with the exception of three surviving cedar trees from the original landscape, no physical evidence of the college can be found.